The Nuclear Non-Proliferation Treaty was an agreement signed in 1968 by several of the major nuclear and non-nuclear powers that pledged their cooperation in stemming the spread of nuclear technology. 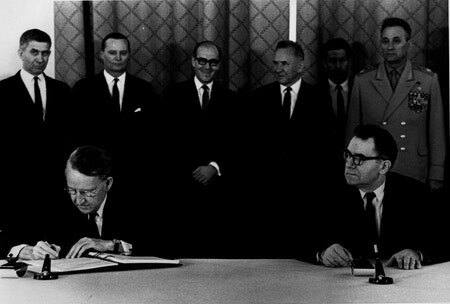 Although the NPT did not ultimately prevent nuclear proliferation, in the context of the Cold War arms race and mounting international concern about the consequences of nuclear war, the treaty was a major success for advocates of arms control because it set a precedent for international cooperation between nuclear and non-nuclear states to prevent proliferation. After the United States and the Soviet Union signed the Limited Test Ban Treaty in 1963, leaders of both nations hoped that other, more comprehensive agreements on arms control would be forthcoming. Given the excessive costs involved in the development and deployment of new and more technologically advanced nuclear weapons, both powers had an interest in negotiating agreements that would help to slow the pace of the arms race and limit competition in strategic weapons development. Four years after the first treaty, the two sides agreed to an Outer Space Treaty that prevented the deployment of nuclear weapons systems as satellites in space. Of far greater import, Soviet and U.S. negotiators also reached a settlement on concluding an international non-proliferation treaty. By the beginning of the 1960s, nuclear weapons technology had the potential to become widespread. The science of exploding and fusing atoms had entered into public literature via academic journals, and nuclear technology was no longer pursued only by governments, but by private companies as well. Plutonium, the core of nuclear weapons, was becoming easier to obtain and cheaper to process. As a result of these changes, by 1964 there were five nuclear powers in the world: in addition to the United States, the Soviet Union, and the United Kingdom, all of which obtained nuclear capability during or shortly after the Second World War, France exploded its first nuclear bomb in 1960, and the People’s Republic of China was not far behind in 1964. There were many other countries that had not yet tested weapons, but which were technologically advanced enough that should they decide to build them, it was likely that they could do so before long. The spread of nuclear weapons technology meant several things for international lawmakers. While the only countries that were capable of nuclear strike were the United States, its close ally Britain, and the Soviet Union, the doctrine of deterrence could be reasonably maintained. Because both sides of the Cold War had vast stocks of weapons and the capability of striking back after being attacked, any strike would likely have led to mutually assured destruction, and thus there remained a strong incentive for any power to avoid starting a nuclear war. However, if more nations, particularly developing nations that lay on the periphery of the balance of power between the two Cold War superpowers, achieved nuclear capability, this balance risked being disrupted and the system of deterrence would be threatened. Moreover, if countries with volatile border disputes became capable of attacking with nuclear weapons, then the odds of a nuclear war with truly global repercussions increased. This also caused the nuclear states to hesitate in sharing nuclear technology with developing nations, even technology that could be used for peaceful applications. All of these concerns led to international interest in a nuclear non-proliferation treaty that would help prevent the spread of nuclear weapons. Although the benefits to be derived from such a treaty were clear, its development was not without controversy. A ban on the distribution of nuclear technology was first proposed by Ireland in a meeting of the General Assembly of the United Nations in 1961. Although the members approved the resolution, it took until 1965 for negotiations to begin in earnest at the Geneva disarmament conference. At that time, U.S. negotiators worked to strike a delicate balance between the interest in preventing further transfer of the technology that it shared with the Soviet Union and the desire to strengthen its NATO allies by giving several Western European nations some measure of control over nuclear weapons. The plan for a nuclear NATO threatened to scuttle the talks altogether, and the United States eventually abandoned it in favor of reaching a workable treaty. A more difficult problem involved the question of bringing non-nuclear nations into line with the planned treaty. Nations that had not yet developed nuclear weapons technology were essentially being asked to give up all intentions to ever develop the weapons. Without this agreement on the part of the non-nuclear powers, having the nuclear powers vow never to transfer the technology would likely not result in any real limitation on the number of worldwide nuclear powers. After two years of negotiations, the nuclear powers managed to make enough concessions to induce many non-nuclear powers to sign. The final treaty involved a number of provisions all aimed at limiting the spread of nuclear weapons technology. First, the nuclear signatories agreed not to transfer either nuclear weapons or nuclear weapons technology to any other state. Second, the non-nuclear states agreed that they would not receive, develop or otherwise acquire nuclear weapons. All of the signatories agreed to submit to the safeguards against proliferation established by the International Atomic Energy Agency (IAEA). Parties to the treaty also agreed to cooperate in the development of peaceful nuclear technology and to continue negotiations to help end the nuclear arms race and limit the spread of the technology. The treaty was given a 25-year time limit, with the agreement that it would be reviewed every 5 years. The Nuclear Non-Proliferation Treaty was, and continues to be, heralded as an important step in the ongoing efforts to reduce or prevent the spread of nuclear weapons. Still, it had one major drawback in that two nuclear powers, France and the People’s Republic of China, did not sign the agreement, nor did a number of non-nuclear states. Of the non-nuclear states refusing to adhere, and thereby limit their own future nuclear programs, of particular importance were Argentina, Brazil, India, Israel, Pakistan, Saudi Arabia and South Africa, because these powers were close to being capable of the technology. In fact, in 1974, India joined the “nuclear club” by exploding its first weapon. Pakistan tested its first atomic bomb in 1983.